I believe, if I'm counting correctly, that the Cincinnati Masters marks the gazillion-and-first final this year for Djokovic (aka Robo-Nole). The Serb has truly captured lightning in a bottle this season. Even when he looks, to an outsider, as if he wants to pack up his racquet bag and check out of the Marriott (vs. Monfils - QF, vs. Berdych - SF), the universe seems to find ways to push him along to his destiny, which today is a 57-1 match record and a shot at a sixth Masters title this year. The previous record was four. Djokovic will face off against Dunblane native Andy Murray for the third time this year. As steady as Djokovic's season has been, is as much of a roller coaster as Murray's season has wound up. Murray reached the Aussie Open final (l. to Robo-Nole), then he didn't win another match until mid-April. He rebounded to make back to back semis at Roland Garros and Wimbledon (l. both to Nadal), winning at Queen's Club in between and then upon his return, was bounced in his first match in Canada. So where does Murray stand coming into the final? Well, he spent a lot of his semifinal versus Mardy Fish grabbing his quad, a troubling sign given how important movement is to his game. We'll see how much the inevitable ice bath helps him get his body in order. However, more disturbing was Murray's mental state. There was a stunning lack of a closing kick to the finish against Fish. He kept breaking the (also hobbled) American and then letting him right back into the match, winning an UGLY encounter on the blue Ohio hardcourts. Robo-Nole, on the other hand, seemed to win on pure identity. Monfils and Berdych both crumbled after taking early leads against the World No. 1. It was as if he looked their way and his opponents' will suddenly vaporized. That's the power of a massive winning streak. Andy Murray was one of a number of players who've come close to short-circuiting Robo-Nole's win streak, taking him to a third-set breaker in Rome, but he failed, as did most of those with opportunities this year. Djokovic's beat-down of the Scot on the Melbourne hardcourts may have been six months ago, but it's fresh in the minds of both Cincy finalists. Robo-Nole seems to be running out of gas, but I'm more concerned that the all-too-human Murray will run out of gumption. If two men step on the court without their best stuff for this final, which is what I expect, there can be only one winner. What is this, 2008? A Sharapova/Jankovic final? This is a meeting between two former World No. 1 s who as of just a couple of years ago were threatening to be the tour's dominant players. The two Bollettieri products are facing off in fact for the 2011 Cincinnati title; the cash, the ranking points and ultimately a nice momentum boost ahead of the US Open. Nether player has been exactly at her best lately. Sharapova, while surging, has yet to consistently re-appropriate the form that led her to three major titles and Jankovic has been on a slow backslide since claiming the top ranking just before the 2008 US Open. Sharapova holds a deceiving 5-1 head-to-head lead over the Serb, having won two of their matches by default, strangely both at 5-2. 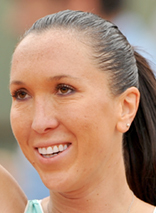 Jankovic has also advanced over Sharapova via walkover (Rome 2008) which doesn't count in their official head-to-head. The last time the two played a full match was all but a career ago, with Sharapova winning their 2008 Australian Open semifinal 6-3, 6-1, en route to her third major title. While Sharapova would start that year in fine form, it was Jankovic who would end it WTA year end No. 1. In recent weeks, it's been a reversal of fortune as Sharapova has reclaimed her perch in the WTA top 10 while Jankovic exited following a subpar spring. On one side of the net we have the steely Russian competitor. She rarely looks to her team, rarely makes an acknowledgment of the score and rarely gets through a tight match match anymore without a bout of the yips (as we saw in her semifinal win over Zvonareva). On the other side, we have the mercurial Serb. There are few players more demonstrative than Jankovic which can work both to her advantage and her detriment depending on the situation. Both ladies could use a big win and both are arguably playing on their best surface. Sharapova, the offense-first fighter versus Jankovic, the defense-minded battler should be hard-fought, if not exactly well-played. Neither is likely to back down from a challenge, but they will take it on differently. Ultimately, Cincinnati's winner will assert herself as a legitimate title threat for the looming US Open and vault a few spots up the rankings. Both women can find themselves cold, with little working. In other words, this could be an ugly match. On the other hand, if both are playing well, Sharapova's puissant offensive versus Jankovic's stretch and flex counterpunching could make for an interesting contrast. At the end of the day, this is going to come down, for better or worse, to who can keep more balls in play. To that end, and against my own gut, to be honest, I'm calling Sharapova the winner. The Siberian siren is the best player of her generation and will be mentally tough in the big moments while Jankovic screams to coaches for her answers that only she and her racquet can provide. I'm pretty sure it's 57-1 for Novak, coming into the final. Going for 58-1. You are correct. Edit made. Thanks for reading. There are many shops that sell Indian saris similar to the one your hermes replica bollywood occasional actress would wear and the collection is therefore referred to as bollywood sarees. If you want to buy sarees as casual would wear, nothing, can beat cotton sarees. They are extremely comfortable and you can easily sport them throughout the day. In prada replica it is preferred by women in the hot summer days on account of it being very airy and light. Such Indian saris are available in various colors and patterns, so you will have an extensive collection to choose from. It would be the best option for a formal business gucci replica belts giving you a neat and crisp look. This, however, does not mean that you cannot use it for fairs. With so much variety that you have in great styles and colors cotton sarees would look good even if worn for any occasion. Ladies fashion has been gucci replica quite regularly and with it the bunch of available fashion online Ethnic Clothing changes too. Most Indian housewives prefer wearing cotton sarees throughout the day. It is even chosen by the to be teachers and other gucci replica as it keeps them comfortable and fresh throughout. To maintain these Indian saris, whatever you would need to do is wash and then iron them and they are ready to be worn again.